I’ve been listening to the Thread Cult podcasts lately (they are awesome). Recently the guest was Nora Abousteit, founder of BurdaStyle.com and now Kollabora.com. Kollabora is a community of designers and craftspeople sharing ideas and photos. That’s where I found Schnittchen Sewing. Schnittchen is a pattern company with easy, casual styles. They have a larger catalog on their German site, and have 10 (right now) patterns for sale on Kollabora that have been translated to English. I was immediately drawn to the Iris Hoodie (you could call me a hoodie addict). So two minutes later I was the proud owner of an Iris Hoodie pattern. I printed that baby out, taped it together got to cutting my fabric. Heaven. Instructions are adequate, and finish with a “Congratulations”! 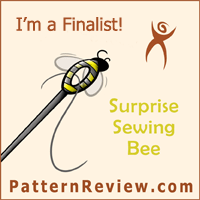 Right now PatternReview.com is holding a New To Me Pattern Company Contest. I hee-hawed around, wondering if I was good enough to enter and decided who cares? I’m entering! 1.Why did you choose this Pattern Company? I was listening to the ThreadCult Podcast about Kollabora (kollabora.com) and how they have independent pattern designers. I took a look and was very drawn to the Schnittchen patterns from Germany. They feature comfortable, casual, easy designs. I chose the Iris Hoodie to try because I had a stretchy camo leopard print shouting at me from my stash. I downloaded it after purchasing it at Kollabora. 3. Did the pattern meet up with your expectations- ie if a PDF was it easy to print. In general was the fit as described, was the pattern a success, company easy to work with? Yes, very easy. The pattern pieces are mainly in German, but there are English translations. The instructions are text only, no illustrations. They do have a Flickr set showing construction steps. The fit was perfect (nice length to both the main body and sleeves). 4. Was sewing this pattern more or less difficult than other pattern companies? If so, why? A bit more difficult because of all the German on the pattern pieces. Also, the instructions note the included seam allowances three times; one time they say it is 1cm, and twice they say 0,75cm. Huh? Then on their site they say 1cm. I figured a quarter of a centimeter wasn’t going to make or break my stretchy hoodie so I went with the (easier for me) 1cm. It worked. 5. Would you buy another pattern from this company? Why or why not. Yes, I would. I have my eyes on the Mona Jacket and Malu Coat. Once you get over the little differences the project becomes easy. 6. Would you recommend this Pattern Company? Tunic length pullover, with or without hood. Sizes 34-44. I made a 38. Luckily a hoodie isn’t too hard, even for beginners. I love the hood shape! It’s perfect! I’m picky about hoodies and actually have a few here with chopped off hoods that were ridiculous looking, lol. The length is fabulous for wearing over leggings. The sleeve length is nice too. Also the wide neckline is very attractive for a woman (show off that clavicle! ), and the hoodie doesn’t feel like it’s choking you. It sits on the shoulders and just looks good. My dislike is just a small style change I’ll make next time I make this. I think the bottom band should be much wider, at least as wide as the sleeve bands. I think it would be much more stylish. Of course you could also omit the band and make a straight or curved hem, or widen the sleeves, omit the bands and make a button tab for cuffing the sleeves…lots of options. A brushed stretchy sweater knit. But I turned it inside-out as I didn’t want to look too “camo-animal-print-ish”. Really, the fabric is like a camo colored leopard print. The sleeve and bottom bands are a rayon/lycra jersey. The pattern said to use a flat-felled seam on the seam inside the hood. I did a serged flat-lock instead. The regular flat lock stitch is on the inside of the hood, with the cute ladder stitch on the outside. I’m very happy with how that turned out (it was my first time doing that). With my main fabric inside-out, the inside of the hood is printed (love that), and the whole inside is very cozy and warm with the brushed surface of the fabric. For the kangaroo pocket I turned some of the edges out so the print would show, but I didn’t want all of the edges to be printed. Again, the inside of the pocket is very cozy and warm. I added a drawstring to the hood for added detail. Yes! I do plan on sewing it again. Yes, I think others should try it – it’s so comfy and fun! The Iris Hoodie is an easy and fun sew. Try it! This entry was posted on Friday, March 14th, 2014 at 2:16 pm	and is filed under Sewing. You can follow any comments to this entry through the RSS 2.0 feed. You can leave a comment, or trackback from your own site. as a need to wear item.